In deference to the deeply held belief of the Asgardians, I have detailed certain personnel to a taskforce that will work on the assumption that their claims of an upcoming apocalyptic war are correct. Accepting the 'Ragnarok' scenario appears necessary for productive diplomatic discourse with the Asgardians, and I am hopeful that in cooperating with their preparations the taskforce will produce considerable valuable intelligence. Letter from UNITED Director Jefferson to the Secretary General. Ragnarok is a two-term society game inspired by Norse Mythology, comics and (very) soft Sci Fi . In the year 2050 members of the United Nations Inter-Terrestial Exploration Department open a portal to what they expected to be an alternate Earth. Instead they find themselves in Asgard and their arrival awakens the gods from a mystic slumber triggering the countdown to Ragnarok. Players can choose to play either unknown gods of Asgard or the human team-members of UNITED. 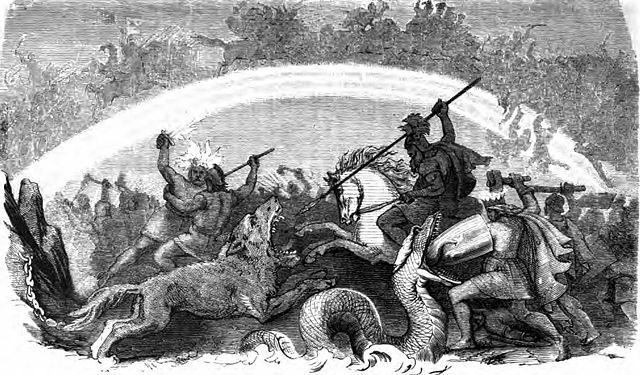 Both groups seek to prepare for the oncoming Ragnarok (which will hit in Week 8) and then to deal with its fallout. Ragnarok is held in the Chapel or East Seminar Room of Mansfield College every Tuesday of Term between 7.30 - 10.30. GMs will be outside the Porter's Lodge to guide you to the room.